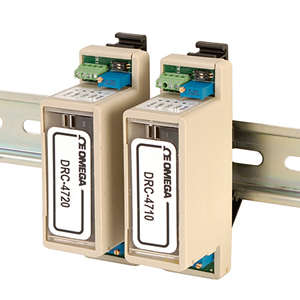 The DRC-4710 and DRC-4720 DIN rail mount signal conditioners are self-contained DC powered modules designed for bridge input (load cell, strain gage) or voltage input (not connected to a bridge, excitation supply not used). These signal conditioners contain a precision instrumentation amplifier, filtered output and a built-in 10V excitation supply capable of driving a 350 Ω bridge. The 0 to 30 mV input range makes the DRC-4710 and DRC-4720 compatible with most strain gage based load cell or pressure transducer outputs. Two models are available, one with 0 to 10 Vdc output (DRC-4710), and the other with 4 to 20 mA output (DRC-4720). Connections are made via easily accessible screw terminal blocks. Zero and Span adjustment potentiometers are located externally as well for easy access.